Blueberry beer is good for sipping and baking! We took one of our favorite local beers - Blu Bobber - and combined it with the bright, summery flavors of fresh blueberries and lemons to create a perfect, tender bread. 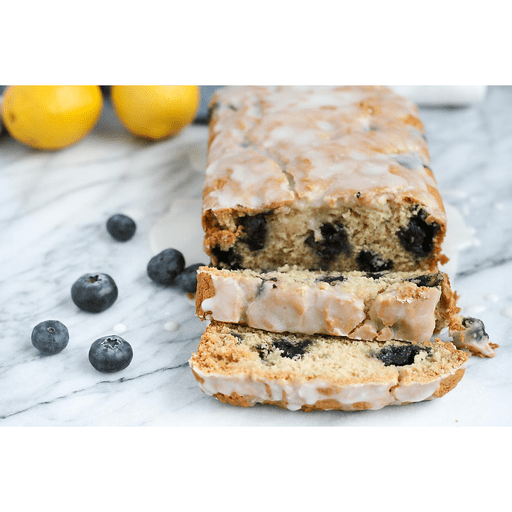 This Blueberry Lemon Beer Bread is great for brunch, dessert or as an anytime treat. 1. Preheat oven to 350°F. Lightly grease an 8x4-inch loaf pan with cooking spray and set aside. 1. In a medium bowl, whisk together 2 cups flour, baking powder, baking soda and salt. 1. Place sugar and butter in a large mixing bowl. Using an electric mixer, beat until well combined. Add the applesauce, vanilla, lemon zest and lemon juice from 1 lemon 1. mix to incorporate. Stir in the beer and mix well. 1. Working in batches, slowly add dry ingredients into wet ingredients 1. mix until just combined. 1. In a small bowl, gently mix together 1 Tbsp. flour and blueberries until flour is evenly distributed. Fold blueberries into batter. 1. Transfer batter to the prepared loaf pan. Bake for 50 minutes or until a toothpick inserted into the center comes out clean. 1. Remove pan from oven and let cool on a rack for 15 minutes. Remove bread from pan and allow to cool completely. 1. Once bread is cooled, prepare the glaze. In a medium bowl, whisk together powdered sugar and lemon juice from 1 lemon until smooth. Pour glaze over the cooled bread. Enjoy! Calories 260, Total Fat 5g (Saturated 3g, Trans 0g), Cholesterol 10mg, Sodium 340mg, Total Carbohydrate 51g (Dietary Fiber 0g, Sugars 29g, Includes 27g Added Sugars), Protein 3g, Vitamin D 0%, Calcium 4%, Iron 6%, Potassium 55%. *Nutritional values are an approximation. Actual nutritional values may vary due to preparation techniques, variations related to suppliers, regional and seasonal differences, or rounding.